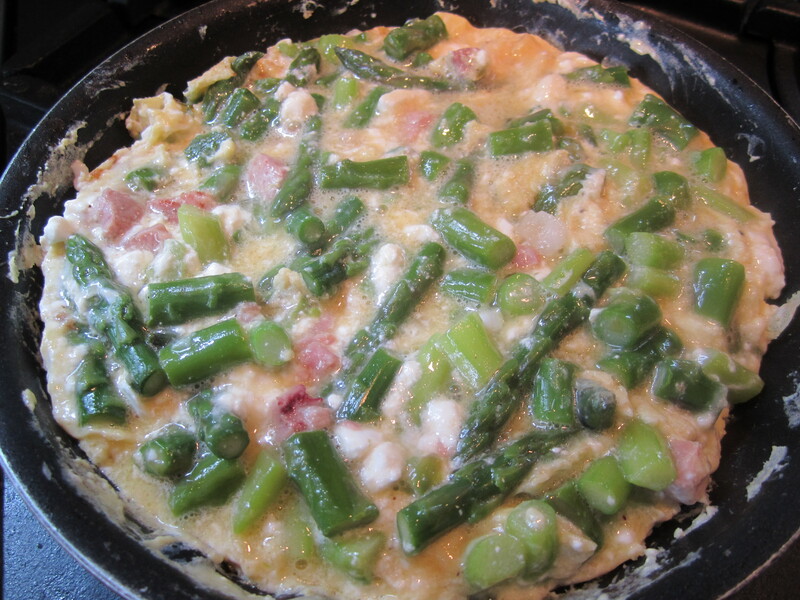 I had asparagus left over from my Spring Pasta with Asparagus and Ramps the other night–I intentionally made double the necessary amount of asparagus the other night, looking ahead to a frittata for Sunday brunch. 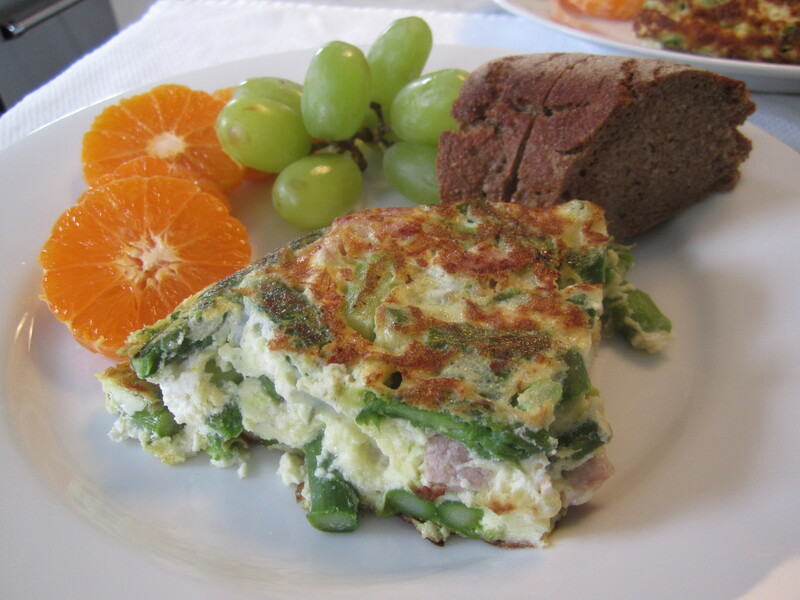 My mother always made frittata for breakfast on Easter Sunday morning, as did her mother, along with most people in their town in Calabria. 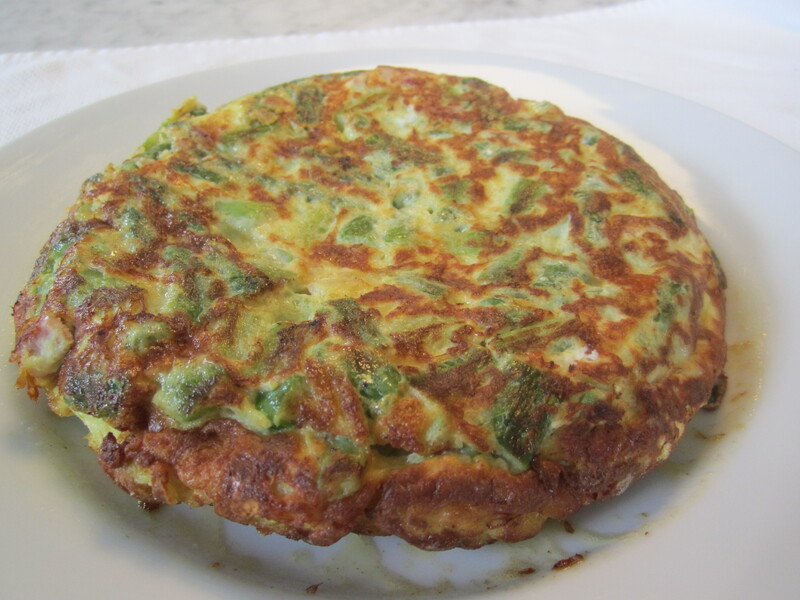 Although the term “frittata” means any combination of fried things with eggs, to my mother and her neighbors, the term always implied the exact same combination of ingredients–asparagus, soppressata (or any homemade cured sausage) and parmiggiano or pecorino. My frittate are a little different from my mother’s in a couple of ways . . . first, I like to make them with any number of combinations–not just asparagus and cured sausage. In the fall and winter, I love making them with broccoli or spinach, and with feta, or ricotta, or any other cheese that goes well with vegetables and melts well. In the late summer, I love making them with zucchini or leeks. The second way in which my frittate differ from my mother’s is that I like to make them taller and fluffer, with an abundance of vegetables, and less eggs. My mother uses more egg, less vegetable, and a broader skillet, which results in a flatter frittata. Also, I add a touch of half and half to lighten up the eggs. I had leftover ham from the pasta dish as well, so I began by sauteing the cubes of ham in a bit of olive oil. Then I added the pre-peeled and cooked asparagus pieces to the skillet and sauteed for a few minutes while I prepared the eggs. I used 4 large eggs for this frittata, along with some ricotta (it contributes to a fluffier frittata). I had some french feta in the fridge as well, so, in place of grated cheese, I’m adding feta for salt and tang. This frittata can be made ahead and served at room temperature, or cold from the fridge. Wedges of it are great as a sandwich in a heated buttered burger bun or soft ciabatta roll, and it keeps well for days in the fridge. It should be allowed to rest at least ten minutes before cutting, to allow the cheeses to solidify after melting. In an 8″ nonstick skillet, heat the olive oil and ham cubes on low. 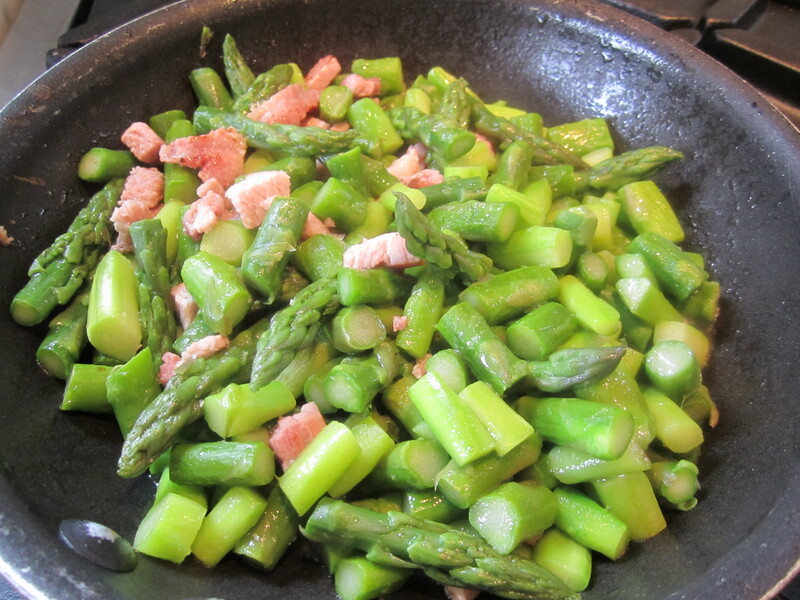 When the ham begins to sizzle and turn golden, add the asparagus and continue heating for about 3 minutes. Prepare the egg mixture . . . 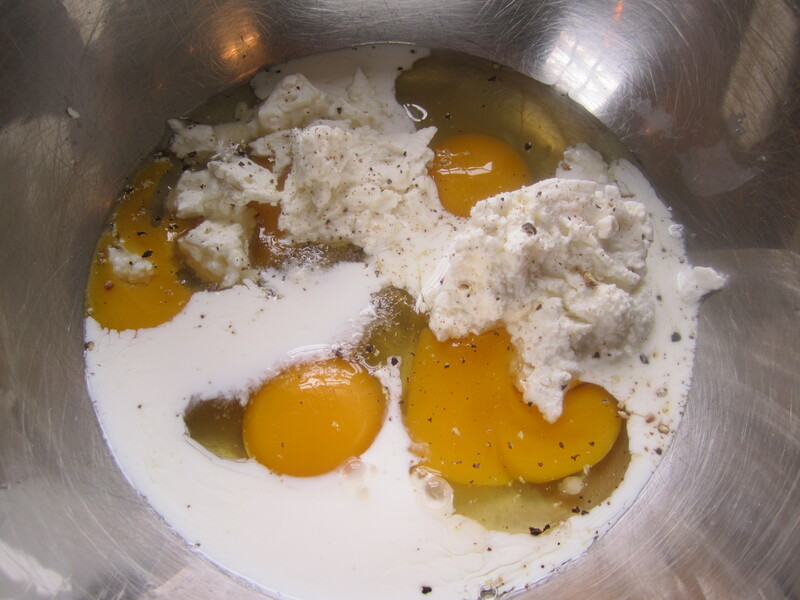 Into a mixing bowl, crack the eggs. Add the remainder of the ingredients and beat the mixture with a fork. Slide egg mixture into the skillet and let set for 30 seconds. Begin stirring from the center of the mixture for a couple of seconds. Continue stirring the mixture and letting it set for a few seconds. Lift the sides of the mixture and allow the liquidy ingredients from the top to run over and underneath the eggs and cook. After gently stirring for about 30 seconds, allow the mixture to begin to set. Make sure heat is very low and let mixture cook, undisturbed, while occasionally lifting a side gently and peering underneath to see if the underside is golden–it should take about 6 or 7 minutes. When the underside is golden, take a large plate and invert it onto the skillet, and in one motion, flip the frittata onto the plate. If there are any bits sticking to the skillet, remove them and add a drop more oil. Slide the frittata back onto the skillet and pat it into a nice fluffy circle (if it’s lost its shape from the flipping) with a heatproof rubber spatula. Continue to cook on low heat for another 6 or 7 minutes, until the underside is golden. To serve, you can either slip the frittata onto a clean plate or invert the clean plate onto the skillet, flip it again, and serve it on the first side–whichever side looks better. Allow to rest for at least 10 minutes prior to cutting.